How does a spot, acne form? Hair follicles are small holes in your skin that an individual hair grows out of. Sebaceous glands, which are attached to hair follicles, lubricate the hair and the skin with an oily substance called sebum to stop it drying out. In acne, the glands begin to produce too much sebum which mixes with dead skin cells and both substances form a plug in the follicle. Plugged follicles, if close to the surface of the skin, bulges outwards and creates a whitehead. If open to the skin, creates a blackhead. What causes the production of too much sebum? Hormones: Increased levels of the testosterone hormone can cause the glands to produce much more sebum than the skin needs. Stress: Stress can cause your body to produce hormones such as cortisol, which in turn tells your glands in the skin to produce more oil. Environment: Environmental factors such as pollution can clog pores and the weather can cause surface dehydration. When the skin’s moisture is not replaced its defence is to produce more oil. Diet: Certain foods raise your blood sugar level more quickly than others. When your blood sugar rises quickly, it causes the body to release a hormone called insulin. Having excess insulin in your blood can cause your oil glands to produce more oil. Another way to determine what it is that is causing you to breakout is to see whereabouts on the face the spots are appearing. See if your dermatologist can do acne face mapping. As a general rule the forehead blemishes are caused by stress, the cheeks by diet and the jaw/chin by hormones. How to deal with excess oil? 1/ Make sure to exfoliate the skin in order to help prevent dead skin cells and excess sebum to mix and clog pores. 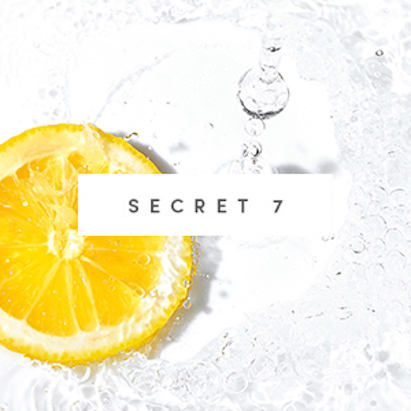 2/ Make sure the skin’s moisture barrier is replenished to avoid your skin creating excess oil to rehydrate itself. 3/ Cleanse thoroughly and gently to clean out any grime from the day. Viridian Nutrition was founded in 1999 in Northamptonshire, by Cheryl Thallon. Vegetarian since she was 18, Cheryl started her career in the natural products industry working in health food stores from the age of 21. Her broad experience of the entire natural products industry led to a specialisation into food supplements. Probiotics: The ability of these beneficial bacteria to influence inflammation has important implications in acne. Zinc: Vital for regulating sebaceous gland activity aside from influencing hormone production. Numerous studies show drastic improvement in skin health after zinc supplementation. Not only does this supplement help with acneic skins but it is also great for those who have eczema. 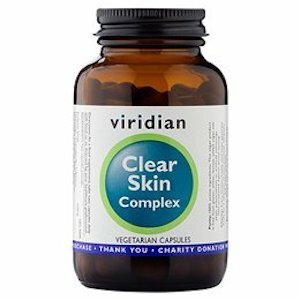 Clear Skin Complex is specifically formulated with targeted botanicals, key minerals and antioxidant carotenoids. The men in the office have been using this supplement and find that it is helping to clear their skin. Solaray supplies supplements for immune boosting, enhancing energy levels and to improve general wellbeing. All products are herbal based sourced from natural ingredients that offer a drug-free solution to healthy living. Burdock Root: Burdock Root supports digestion, removal of toxins and its nutritional qualities will all collectively help to promote healthy skin. 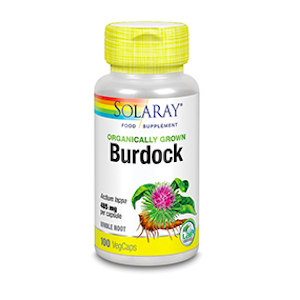 Burdock Root is very detoxifying; it contains compounds that inhibit inflammation through a variety of mechanisms including purifying the bloodstream of compounds that cause inflammation. The Advanced Nutrition Programme pride themselves on scientifically researched formulations made with quality ingredients that feed the skin from within. Vitamin A: Maintains normal skin and vision. Also contributes to the normal function of the immune system and plays a role in the process of cell specialization. Vitamin C (as ascorbic acid): Contributes to normal collagen formation for the normal function of skin. Maintains the normal function of the immune and nervous systems. Also contributes to normal energy-yielding metabolism. Protects cells from oxidative stress and contributes to the reduction of tiredness and fatigue. The girls in the office have been trialling this supplement for a month. The programme is 3 months so we are yet to see the final results. That said, the vitamin A in this will help nourishes all layers of the skin to help clarify and clear the skin. This vitamin A also does not cause the skin to peel, flake or dry. Sold on Victoria Health, and highly recommended by Shabir Daya, Thyme Out is the only organic natural solution to help treat acne, eczema, psoriasis, rosacea, cold sores, itchy and inflamed skin, cuts, grazes, prickly heat, pet rashes, nappy rash and almost every single inflammatory skin condition. 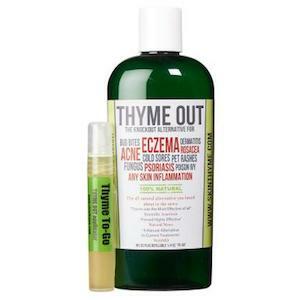 Organic Thyme: Thyme displays powerful anti-inflammatory properties which helps soothe skin. Thyme is powerful at eradicating Propionibacterium Acnes, the bacteria that cause acne, more so than any other acne medication. The organic thyme that is used in this product is steeped for weeks to draw out all the amazing properties of this herb. Aloe vera, added to the formulation, is also known for its skin soothing benefits. Allies of Skin was founded by 30 year old entrepreneur Nicolas Travis, who suffered with severe acne himself. He studied bio-medical and pharmaceutical sciences before graduating from French business school. The brand launched with only the one product (1A All-Day Pollution Repiar Mask) but now has 8 SKUs. Allies of Skin uses many potent ingredients such as antioxidants and probiotics. 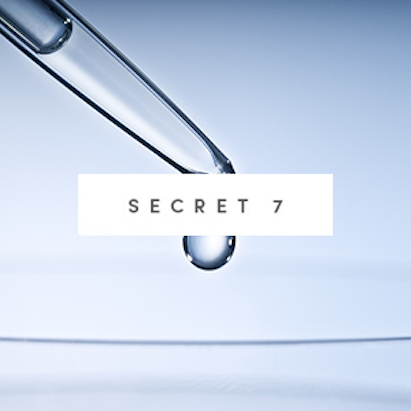 Mandelic, Lactic, Pyruvic and Azelaic Acid: A powerful blend of acids fights blemishes, speeds up cellular renewal, encourages collagen production, lightens dark spots, increases hydration and strengthens the skin barrier. Colloidal Silver: Provides excellent antibacterial properties that help fight blemish-causing bacteria, in addition to boosting the skin’s natural reparative process. This Blemish Facial works really well to unclog pores as well as nourish the skin. Maiko from the office has been using this and finds it helps fight any congestion. Rhassoul & Kaolin Clay: Mineral-rich clays draw out pore-clogging impurities and reduce sebum. Colloidal Silver & Manuka Honey: Provides essential trace nutrients and excellent reparative properties that improve skin quality and assist in reducing breakouts. This cleanser helps to unclog pores from any impurities. 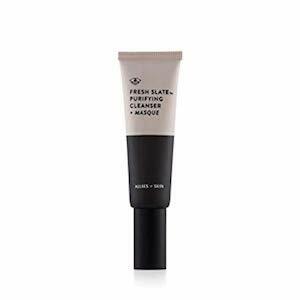 It has a balm like texture that emulsifies. When her teenage sons started having skin problems, Stephanie Capuano started to search endlessly both on the high street and premium options. She found that there wasn't anything that she thought was good enough without all the harsh chemicals found in leading brands, and that her boys would actually want to use. Inspired by what it felt like growing up in California (the 31st State), Stephanie created a brand devoted to teenage boys. Lactic Acid: Exfoliates on the surface of the skin by breaking down the material that holds dead skin together, allowing it to shed naturally as it once did. One of the most gentle exfoliants on the market. Tea Tree Oil: Tea tree oil is a popular choice for treating acne because of its anti-inflammatory and antimicrobial properties. It's thought to calm redness, swelling, and inflammation. It may even help to prevent and reduce acne scars, leaving you with smooth, clear skin. 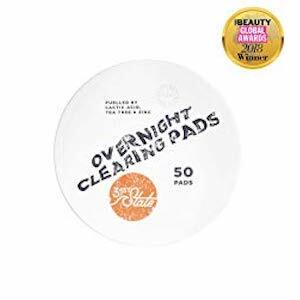 These Overnight Clearing Pads have been designed with congested teenage skin in mind. They help to exfoliate and unclog blocked pores with natural, paraben-free ingredients. Manuka: Manuka honey could help keep your skin free of bacteria, which could expedite the acne healing process. Also, given its anti-inflammatory properties, manuka honey is said to decrease inflammation associated with acne. Witch Hazel: Has antiseptic, anti-irritant, antibacterial and potent anti-inflammatory properties; great for fighting back against those irritating spots. 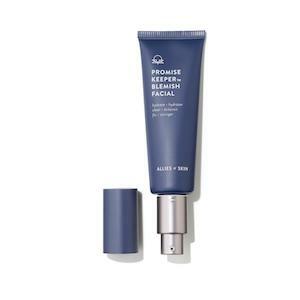 This spot gel actively fights the bacteria that cause spots, blemishes and redness which helps reduce inflammed spots. Especially formulated with Shabir at Victoria Health, Garden of Wisdom tries to use as many active ingredients as possible and makes sure to use correct strengths within their serums. It is also a vegetarian brand that is cruelty free. Azelaic Acid: This acid can significantly diminish blemishes, help fade the appearance of post-acne red marks and other discolorations, and reduce the kind of skin sensitivity that leads to redness. Hyaluronic Acid: Promotes the retention of moisture that protects and shields the skin against free radicals and environmental stress. This acid is great for acne-prone skins as it unclogs pores to prevent acne from occuring. One of Shabir's favourite acids for acneic skins. 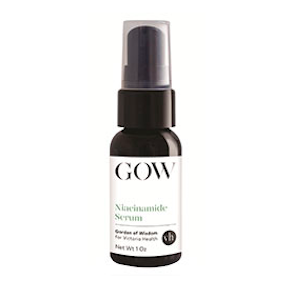 Niacinamide: Penetrates skin effectively to regulate sebum activity helping to prevent acne breakouts. Pantothenic acid: Binds to moisture acting as a natural hydrator to improve skin’s softness and elasticity. 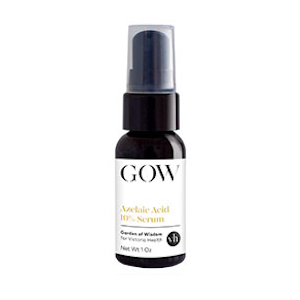 This serum is designed to penetrate skin effectively to regulate sebum (oil) activity helping to prevent acne breakouts. Salicylic Acid: Helps exfoliate skin and deep clean pores. Salicylic acid dissolves away pore-clogging dead skin cells whilst deep cleansing pores. Salicylic Acid 2% Serum helps fight the appearance of acne, blemishes, blackheads and enlarged pores. It does this by reducing inflammation as well as deep cleansing pores of dirt, debris and excess oil.